> Aboriginal art: Rich profits, poor artists? You will be surprised how little Aboriginal artists are paid in many cases, while their paintings fetch prices in the millions. Highest price for an Aboriginal painting around 1990 . Highest price for an Aboriginal painting sold in 1994 . Highest price for an Aboriginal painting sold in 1999 . Highest price for an Aboriginal painting in 2008 . Annual worth of the Aboriginal arts market in 2007 . Payouts Australia's resale royalty scheme generated for Aboriginal artists in its first 6 years of operation . Amount of the majority of resale royalties paid . Number of artists in the history of Aboriginal art whose work has sold for more than $100,000 . Australian Aboriginal art is sold all over the world, sometimes fetching very high prices. Where go these huge profits from that artwork? Do Aboriginal artist receive their fair share? And what happens if the artwork is sold on? 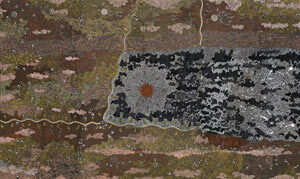 Clifford Possum Tjapaltjarri's painting Warlugulong. Its value rose by 2,000% within 30 years. Each year Aboriginal art contributes $100 million to the Australian economy . Aboriginal paintings fetch high prices at auctions. Warlugulong by Clifford Possum Tjapaltjarri was first bought by the Commonwealth Bank in 1977 for AUD 1,200. In 1996 the bank sold the painting for AUD 36,000. In July 2007 the National Gallery of Australia bought it at a Sotheby's auction for AUD 2.4 million , the highest price ever paid for an Aboriginal painting and an increase on the original price of 2,000%. Similarly, Johnny Warangkula Tjupurrula's Water Dreaming was reportedly sold in 1973 for $150. In 2000 the painting changed hands for $486,500, a rise of 3,243% in 27 years. However, many times these profits don't make their way back to the artist. Unscrupulous dealers pay artists with cars and illegal and prescription drugs to work in "sweatshops", trapping them in a cycle of poverty . When sold through regular agencies, the most common split of sales through art centres is 60% to the artist and 40% to run the art centre. Guess how many artists earn $7,300 or less from their art in a year. To help artists earn at each resale of their artwork the French government in 1920 introduced a resale royalty, and resale rights have now been introduced right across the European Union . In Australia the National Association for Visual Arts (NAVA) and Arts Law Centre of Australia lobbied successfully for the introduction of resale royalties which was approved by the federal government in 2008. On 1 July 2009 the resale royalty scheme was introduced which became law on 9 June 2010 . Under the scheme 5% of the resale price is paid to artists if their work is sold for AUD 1,000 or more . All Australian works under copyright will attract the resale royalty if sold after 9 June 2010, not just works created after the laws are passed . The scheme applies to works by living artists and for a period of 70 years after an artist's death . For works acquired before 9 June 2010 the royalty will only be triggered on the second re-sale. A non-profit organisation, Copyright Agency, manages the scheme and collects the royalties, distributing them after taking a 10% cut . In the first year it generated $325,000 in royalties for 1,630 resales, and most recipients were Aboriginal artists . Australian law entitles artists to copyright royalties but this concept still faces significant resistance from auction houses and galleries. In fact, some public galleries require artists to sign a copyright waiver before they accept their paintings for exhibition. There are also concerns that the resale royalties only help a minority of artists. In 2006 and 2007, only 2 of the 20 top-selling Australian artists were Aboriginal , and just 5 in 2016 . Problems arise when the artist has died and there are many family members potentially entitles to receive the royalty. Aboriginal family lore does not accept royalty payments going only to the next of kin . Another problem is how to get royalty cheques to people in remote communities who don't have phones or postal addresses. Resale rights are recognised in 81 countries. For more information on the resale royalty scheme go to www.resaleroyalty.org.au. In 2007 a Senate inquiry found that many Aboriginal artists were working in squalor for minimal pay, drugs and second-hand cars . As a consequence the Australian government launched the Indigenous Art Code in July 2010. The voluntary code aims to end dodgy sales practices and will be administered by a committee on behalf of the Aboriginal Australian art industry. For more details check out the Indigenous Art Code website. Superannuation legislation. Some buy Aboriginal art as an investment for their superannuation. Laws around how to store art influence if it's viable to buy. Resale royalties. As good as resale royalties are for Aboriginal artists they mean that art prices can go up to include the royalties. Supply levels. If there is an oversupply of Aboriginal art, prices go down. Fake art. Stories about fakes, frauds and dodgy dealings with vulnerable artists all influence buyers' decisions. Quality of works. When a lot of average art works hit the market people are less likely to buy. Non-Aboriginal staff. There is a lack of Aboriginal art marketers, reviewers, editors and publishers. But they have a limited understanding of Aboriginal art and the cultural understandings of why an artist makes the work and where it comes from. If Aboriginal people represented Aboriginal artists, their products could be promoted better.